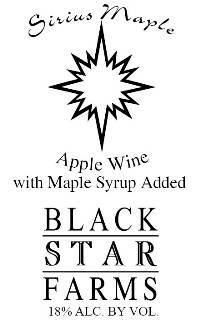 Taste the flavors of Northern Michigan in this unique dessert wine made from our Hard Apple Cider, Apple Brandy and Michigan maple syrup. Made in a port style this wine has the perfect balance of fruit and brandy flavors. Distinctly apple layered with sweet barrel aromas. The maple flavor stands out and lingers long on the finish. Enjoy this wine for the next five to ten years. This is the ultimate dessert wine that pairs wonderfully with fall inspired sweet treats. Some recommendations include, pumpkin rolls, pecan pie, pumpkin cheesecake and traditional apple pie. There are also many different ways to use this wine in recipes. A few ideas include, waffle or pancake sauces and pears or apples baked in a Sirius Maple Sauce. Our distillation operation allows us to create some wonderful port-styled wines while incorporating our local fruit. This is no exception. We consider this to be one of the best ways to showcase Michigan apples.